Global Business Case Competition (GBCC), one of the oldest undergraduate case competition in the world was held during April 9 - 14, 2018. 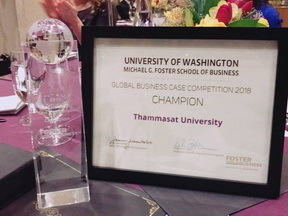 The competition was organized by University of Washington's Foster School of Business, and this year Thammasat University is one of the 12 invited business schools to participate in this prestigious case competition 2018. The team is comprised of four members including Wassaporn Viranggorn (BBA#23), Parit Keeratiyothin (BBA#24), Bhan Janejarassakul and Tatthon Thanaboriboon (BBA#25) along with our advisor Assoc. Prof. Dr. Aurathai Lertwannawit. After a long 12 hours flight, our team arrived in Seattle. Briana Nguyen, our team buddy was there to pick us up. 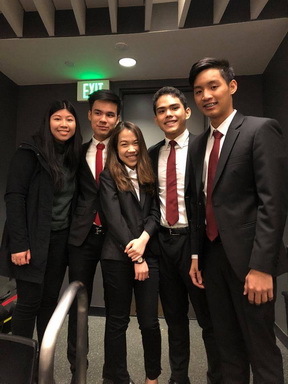 We arrived at Seattle one day earlier before the competition started, as the team adjusted to jetlag after a long flight from Bangkok. Awaited us next morning comes the real deal; the format this year required us to crack two cases in total, including 4-hour short case and 44-hour long case. Initially, teams are randomly drawn and allocated into four divisions, with each division consisting of three teams. On the short case cracking day, we had four hours to crack and prepare to pitch to a top management team. Case's company is Harley-Davidson, one of the largest motorcycle manufacturer in the world. It was a tough time since the time constraint pressured us to wrap thing up in four hours which were not our aptitude. Finally, our effort was paid off and we came first in the division! Nevertheless, the journey was far from over. On the long case cracking period, we have 44 hours for cracking the case and preparing presentations. Teams were assigned to analyzed and pinpoint an expansion strategy for AWS's (Amazon Web Services) data centers. Despite a complicated business model and data overloads, due to our strict adherence to timeline and team synergies, we managed to craft what we believe was the winning recommendations. Time were spent majorly on research to asses and prioritize each potential region, considering all the business factors and potential risks. On the presentation day, only the first place of a division will pass onto the final round. Our division was filled with teams with high potential. Full faith in our team, and have �no regrets,' we walked out of the first round presentation with brimmed confidence. At the announcement of finalists, our team was announced the winner of the division in the preliminary round. And after what the judges mentioned was one of the toughest and closest deliberations- Thammasat University was announced this year's GBCC 2018 winner! Our success would have never been possible without all the support we have received since way before our journey has started. We would like to express our sincere appreciation and gratitude to our advisors who have played a vital part in our success. First of all, thank you Assoc. Prof. Dr. Aurathai Lertwannawit for all your support and care for us, we sincerely appreciate that. Also, thank you to Dr. Worapong and Ajarn Supawat for coaching and given great guidance throughout our preparation. Failing not to mention our appreciation for BBA's office staff for their great support and easing every process throughout our journey. Last but not least, we would like to thank BBA Thammasat Program for supporting and giving us this precious opportunity.